For some reason my photos are not uploading to the blog so I have tryed to get around it by putting a slide show on photobox. The link should be…. Hopefully will get around to adding some stories of what I’ve been up to in the next week or so and finish the blog with the photos in it. Just facing my last day in the states tommorrow before heading back to Australia, base feels kind of funny here with only a couple of names left on the mail boxes and everyone trying to sort out what to do next. Feels strange to be returning to Australia with so many friends gone but I am sure it will be just the same once I get back. For most people the mention of the town of Leavenworth in Washington would either mean nothing or would bring images of lederhousen (I have no idea how you spell this and neither does the computer) and waffle haus’s. Leavenworth is surrounded by the Northern Cascades with lots of amazing rivers and climbing but is also a bavarian theme town which basically means that mcdonalds and Starbucks have to be Mcdonalds Haus and Starbucks Haus (with minutely different signs) and everywhere else gets to charge huge prices for hot dogs with german sounding names. So thats where the road trip took us. We quickly found a friendly looking car park and set out to sample some fake Bavaria, beer, food and karaoke. Steve Southards truck is piled high with climbing gear and we have a packed itinerary but it still takes us a day to sort out where we are and where we are going. 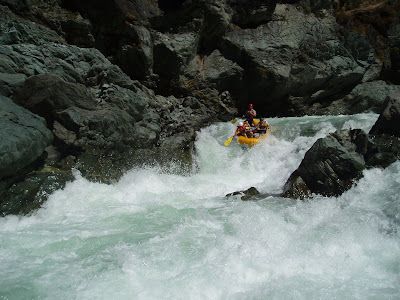 The next day sees our plans for an early start blown out the window as we sleep in eat breakfast and face the steep approach to snow creek wall. The lack of early start means we have to wait at the base of the route we want to climb, something that I always say I will never do again but always do. The first pitches wind their way through grooves (dihedrals) and leges and then its my turn. I stare up at the 5.9 (HVS I think in the british grades) and am thankful that it doesnt overhang like it looked like from the ground. I like multi-pitch climbing as it means that falling means hitting space and not the ground, shame about the ledge we’re standing on. I set of up the pitch realising that I havent climbed in a month and have no idea what 5.9 granite is meant to feel like. It feels hard, or rather it feels ok till I get to the crux. I can tell its the crux by the undercling covered in more chalk than necessary. I place a nut in the crack to my left and pull up into the undercling to feel the holds above. They dont feel as big as I would like. A couple more times i do this up and down shuffle before I look down at the two steves and realise that I’m going for it. I pull the undercut with my right, shuffl my feet up and reach blindly into a crack with my left, surely it shouldn’t feel this hard? I think as my hand barely jamms into the crack slipping on some pebbles in the base of it. I’m commited now and keep going, bringing my left foot up to a small foothold. Suddenly I realise my left foot kicked something on the way past and look down to see my last piece of protection falling down the rope. Both steves look horrified and I realise that a fall now is not an option as hitting the ledge from 40ft would not be pretty. I keep pulling at holds letting my feet sort themselves out below me, grasping at handholds and pulling as soon as I have them. finally my feet are on two good edges and my left hand feels solid on a big hold. I swear at myself in my head and stare down the ropes at the steves. Steve S is the first to speak “can you put some gear in” my reply was probably less than kind as it was definitely the first thing on my mind other that survival. The rest of the pitch went well, a traverse across the wall to another ledge. The rest of the climb went smoothly up a beautiful crack to finally top out in the early evening and hurry back to the truck. The next day saw us in the rangers office to get a permit to camp in the “enchantments” We knew there was a lottery every day at 7.45 but still managed to turn up at 8.30. For some reason rangers always make me feel nervous and 12 years old. This one kept telling us how lucky we were to get a permit though I think that anything that costs you $30 has nothing to do with luck. Then she asked if we wanted a map for $5. We all looked at each other and I knew none of us wanted to pay for a map. we started to make excuses and she told us how important maps were and how easy it was to get lost. i wanted to aske her how many scottich blizzards she had been in but stopped myself. We reasurred her by telling her we would think about it and headed to the library to photocopy a better map for ten cents. The afternoon saw us in for a long slog, 11 miles with 6000 ft of height gain up through the valleys and past lakes till finally we reached the enchantments. 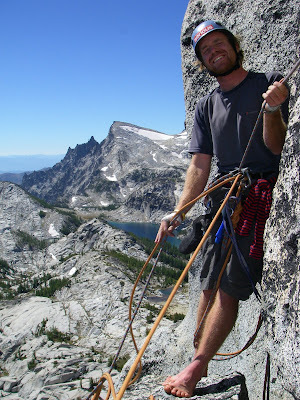 The enchantments are old glacial lakes surrounded by granite peaks and are absolutely magical. We found a spot to sleep under prussik peak between two lakes cooked some dinner and slept. The next morning saw us hanging our sleepeing bags and all our gear from the trees to keep it away from the “snafflehounds” (mountain goats that will eat anything looking salt). 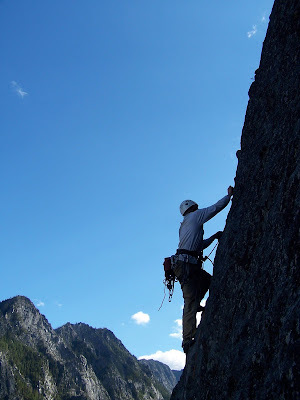 In no time at all we on the climb a 6/7 pitch 5.10 on perfect granite going straight up the south face. after a few pitches of beautiful climbing and some interesting moments like squeezing through a small hole under a chockstone we were standing under the second to last pitch, a 5.9 flared chimney. Unfortunately I had previously expressed my love of this type of upward grovelling and it was my lead. the first section went well up some cracks and pulling into the flare which looked like it was big enough to fit all of me inside. As I pulled into the flared chimney I realised a couple of things, it was at such an angle that I was going to feel like I was constantly about to fall out of it and there were no real holds to speak of. I set of wriggling and thrutching , throwing elbows and knees where ever they stick. After 10 minutes of thrashing and lots of grunting I stopped and realised that I had made about 4ft of progress and that the the steves were shouting encouragement from below. i kept on with this method of travel and managed to cliip one of the peices of fixed gear. the next piece was a bit of an issue as I would get to the position form where i could clip it but by the time I had got the quickdraw to it I had slid down enought that it was out of reach. 3 attempts later it was clipped and i set off again. I grunted my way to a large ledge and brought up the steves. The last pitch of the route was Steve S’s a 5.10 crack system with every crack technique thrown in for good measure and the final steep hand jam moves right at the top(pictures to follow). He lead it with style and we were soon on the summit enjoying the view and getting ready for the 4 abseils (rappels) to get off followed by the hike back to the truck. Between this route and the enchantments I have now bumped the USA up my list of favourite countries. Next up was MT Rainier. 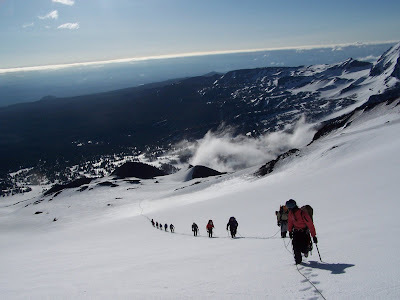 Rainier is the most glaciated peak in the lower 48 and extremely popular mountain but most people climb it by one of the easy routes emmons or ingrahams glacier. We were heading for the Kautz ice route a slightly harder proposition with a couple of pitches of ice climbing rather than just glacier travel. Again the usual american nonsense of permits and passes (I really hate paying to climb) and a night in i local bar being thrashed by the local pool shark (who was probably 50) and we set off. We were trying to travel light meaning we each had the clothes we were wearing, our rain gear and don jackets, one stove, one 2 person tent and our climbing gear. We made quick progress over the glaciers and moraine to gain the final rock section were we planned to camp for our summit the next day. The wind was howling. We found some flat spots and dropped our bags. according to our estimations we were at 11,000ft just below an area called camp hazard. Steve B and I started exploring further up the ridge to get a good idea of where we were but the mist just thickened and the wind got stronger the higher we went. we lay and sheltered in an old bivy spot as the snow fell on us and wind howled past and we decided to go back to the bags. We got down to find the other steve struggling to pitch the tent and we set about building a wall around the site he had chosen. Suddenly a huge gust of wind ripped past, pulling the previously secured tent out of the ground wrapping it around Steve and taking it with him. It all happened pretty quickly with Steve (still holding the tent) deposited on a rock 10 ft below where he had been standing. Steve had landed on a couple of bits of his body at once and was pretty shaken up. The tent had a couple of holes and one of the poles had snapped in two places. The trouble with going light is that there really isnt anything thats spare to fix things with but eventually the tent was up and standing, tied into the now large wall and with two ice screws splinting the pole. I opted to cook while steve B kept the injured steve from doing anything else to himself (he popped some major painkillers and kept telling us he was fine). I sat and watched the stove (and the pot lid that kept trying to blow away) as the clouds rolled in and out occasionally exposing Mt adams and hood in the distance. The eveing was pretty funny in some ways, the three of us crammed into a small crippled 2 person tent as the wind hammered past. I had the dubious honour of getting two sets of feet at my head end and constant requests to pass the things left by the door (my head end) while steve S pretended he wasnt too hurt. Despite good conditions the next morning and Steve showing us he could swing and axe (while grimacing) we decided to head down. It looked like steve had probably chipped or fractured his right elbow and probably dislocated and relocated his left thumb as he fell. It felt rather like a sign. First up here are some photos of the last few months a mix of work and play. Looking back down the Prouty Glacier just after dawn, South Sister. 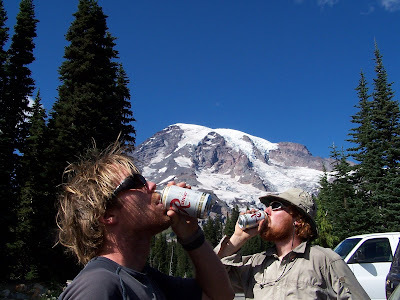 Drinking a Rainier beer below Mt Rainier (the most glaciated peak in the lower 48 states). 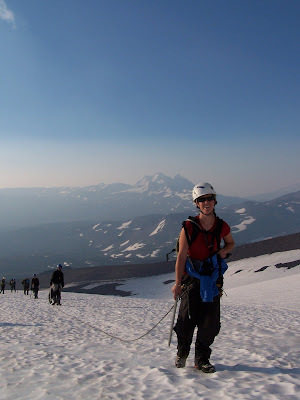 Jess dragging some young men up their first mountain (on the hayden glacier leading to Middle sister) broken top in the background. As some fo my friends appear to have 4 email addresses and some don’t seem to use theirs any more I have decided to follow the trend and set up a blog. Apologies as I get this up and running but I hope to get photos up on here (i dont know if thats even possible) to share some of the stuff that I get up to. As some fo my friends appear to have 4 email addresses and some don’t seem to use theirs any more I have decided to follow the trend and set up a blog. Apologies as I get this up and running but I hope to get photos up on here (i dont know if thats even possible) to share some of the stuff that I get up to. I also hope this may allow me more time to reply to emails but we shall see if that actually happens.